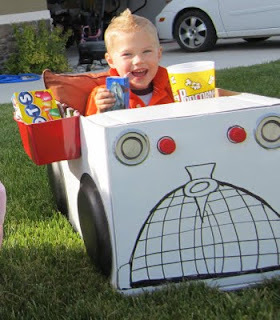 Mommas Kinda Crafty shared her tutorial on how to make this Drive In Movie Car. What a fun idea this is! I know my in-laws host movies outside on the lawn at their house all the time. What fun it would be to make these cars for the little ones before hand. It would be a great activity to do while waiting for the movie to get set up and begin. The details on the car are so cute! Especially the licence plate...so fun! The Inspired Housewife shared how to make a Super Slip and Slide. I know we are planning a big, wet birthday party for next month and this would be perfect for one of the water activities. It sure looks like the kids are having a great time! I love how, unlike a traditional slip and slide, there is room for all the kids to play at once. No more fighting over turns...they can all play together. LOVE it! 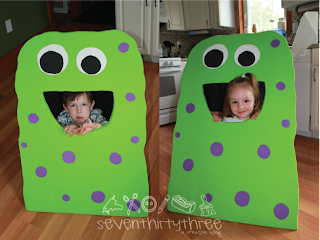 SevenThirtyThree shared how to make these cute Monster Photo Ops. I think they are so fun looking with the kids poking out of the Monster's mouths. This would be a simple way to add a lot of fun to your next monster party...or change it up and add it to any theme. What I like the most is the great attention to detail. She didn't just leave the mouth open for the kids to pop out of...she placed a black piece of fabric so you couldn't see behind and it really looks like the kids are popping out! That's detail. Tales of a Trophy Wife shared this awesome Mario Cupcake Cake. I'm a huge fan of cupcakes, especially at parties, since it's so much easier to serve and eat these on the go than a regular cake...but I really don't like Cupcake Cakes. Especially when the decoraters combine them together with frosting and decorations. Yuck. But this cake is pretty awesome. I imagine it took some planning to be able to frost them right and lay them correctly, but it's SO worth it. 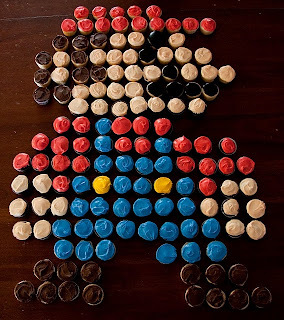 This cupcake Mario is AWESOME! 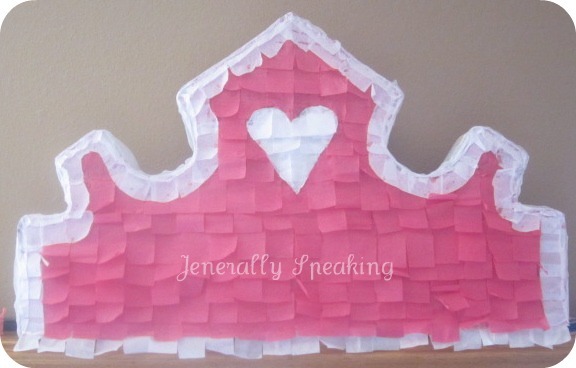 Jenerally Speaking shared how to make your own Pinata. After having done a few parties in the last little bit, I've learned that our little town has no stores that carry pinatas. And while I HATE them personally, the kids LOVE to have these candy treats at their parties. It's so helpful to have the DIY instructions on how to make your own...and not just a pinata that's round, but different shaped ones for your party theme. And it's alot cheaper! I'll definitely put this idea on my Pinterest party board for Lots of future use.